Hundreds of protesters took to the streets in the central Syrian city of Homs on Thursday after a double bombing killed dozens of children outside a primary school a day earlier. It was a rare demonstration of anger against the authorities in the largely government-controlled city, with protesters calling for the resignation of the Homs governor. 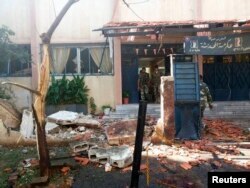 A handout photo distributed by Syria's national news agency SANA shows soldiers around wreckage in after twin suicide bombs tore through a school at Akrama neighborhood in Homs city, Oct. 1,2014. Amateur video footage from the scene of Wednesday's attacks showed the second blast hit as adults scrambled to rescue the victims from the first detonation. Syrian state media is reporting at least 25 children and eight adults were killed. The Britain-based Syrian Observatory for Human Rights says 47 children died. UN Secretary-General Ban Ki-moon called the school attack on Wednesday "an act of the utmost depravity."